A truly HUGE family camping bag, the Mammoth easily fits couples and even a kid or pet. Its nearly as big as a queen size bed, with zippers on both sides to get in and out without waking up your partner. A third zipper on bottom means you can separate the bag into two quilted blankets. Use the side zippers to connect an unlimited number of Mammoth bags for a cousin reunion or big party. The Mammoth bag is made with the same construction and materials as highly-rated TETON Sports® Celsius series sleeping bags. It contains 8.5 pounds of SuperLoft Elite 4-channel hollow fiber insulation with double-layer offset stitching. Shoulder baffle cinches around everybodys necks to prevent drafts. Full-length side zipper baffles and Velcro tabs At the top of zippers keep zippers in place and cold air out. Drawstring mummy-style hood can be flipped over head and ears. Even includes a massive stuff sack with compression straps. If you stuff rather than roll, we promise the bag will fit. 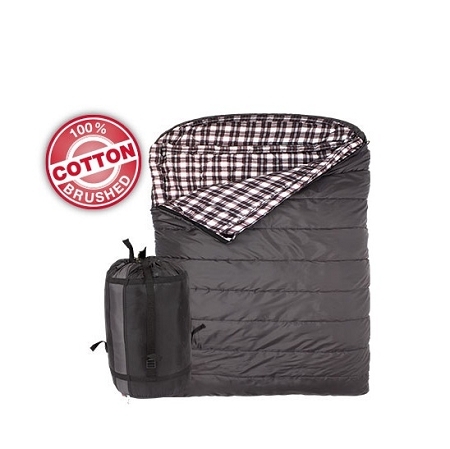 If you need a giant bag more suitable for cold-weather camping, order the TETON Sports® Mammoth -18C/0F instead. Double Wide Size - Mammoth is 94L x 62W, nearly the size of a queen mattress. 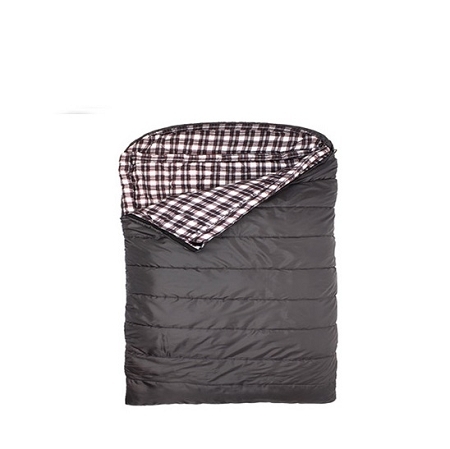 -7C/+20F Temperature Rating - Suitable for warm-weather, RV, cabin or living room camping. Stain-Resistant Outer Shell - Sturdy taffeta shell is lightweight, easy to pack and stands up to years of use. Drawstring Mummy Hood - Half-circle hood with drawstring keeps pillows and heads off the ground. Shoulder Baffle - Padded fabric cushion between bag and hood tightens to trap body heat. Zipper Channel Baffles - Extra layers of fabric and fill run the whole length of the side zippers to keep out drafts. 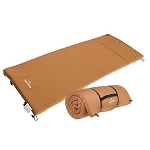 SuperLoft Elite Fill - The SuperLoft Elite 4-channel hollow fiber insulation provides loft and warmth. Flannel Lining - Soft lining wears well, holds in body heat and feels luxurious. 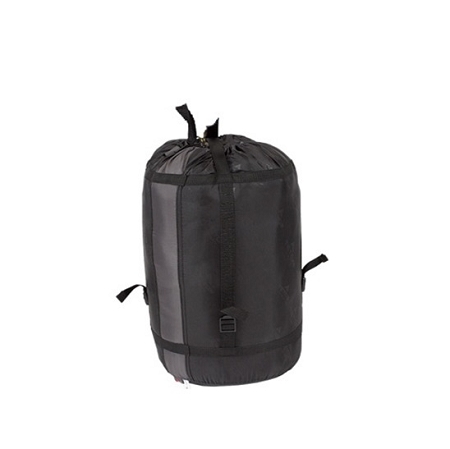 Durable Stuff Sack - Oxford nylon stuff sack comes with drawstring, webbing and compression buckles. Zip-Together Design - Connect multiple Mammoth bags for a massive sleeping area. Competitive Edge Products is an authorized distributor of mammoth sleeping bags by Teton. the Teton Fahrenheit Mammoth sleeping bag..which is wonderful..thank u! 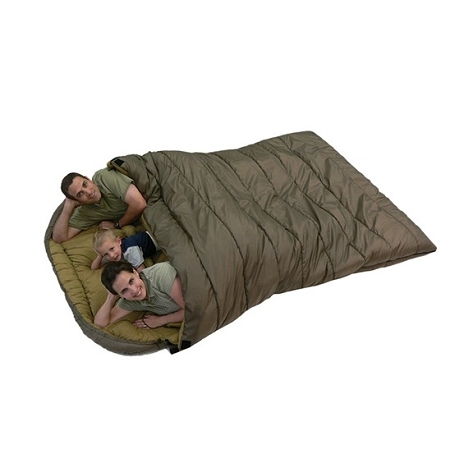 Q: How is this different from the other mammoth sleeping bags? A: They are very similar, but the colors differ, along with the temperature ratings. Size (packed) 27" x 14" x 14"
Fast Shipping: Orders for the 111 Mammoth Teton Queen-Size Sleeping Bag generally leave the warehouse the same business day if ordered in the A.M. These ship Fedex Ground, and delivery times vary by location. Delivery typically takes 2-5 days, call for more exact estimates. Faster shipping is available. Dimensions: 27" x 14" x 14"